I'm taking a little blog vacation for the rest of this week. Not an in-real-life-vacation like our recent trip to Hawaii, just a break from the computer and iphone and ipad and the tv. Thankfully I have some amazing friends who will be here to teach you to do things that I never do:) Like today, Jessica, who has the best name, will show you something that involves sewing! I'm paying really close attention in case I ever decide to explore this area myself. Enjoy! 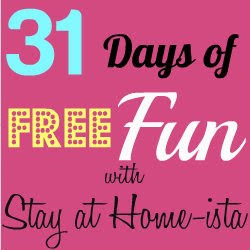 Hi, my name is Jessica, and I blog at Mom 4 Real! 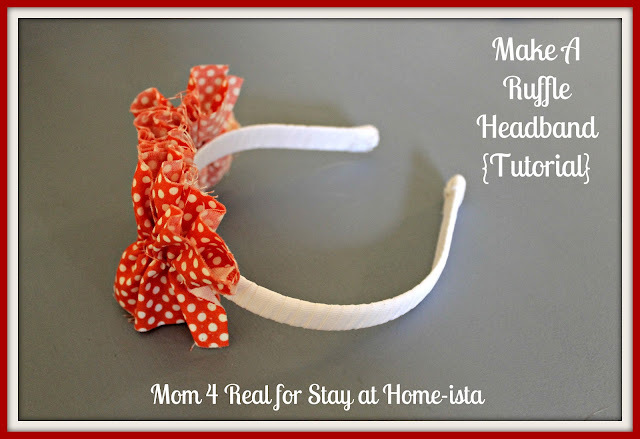 I am so happy to be here at Stay at Home-ista today sharing my tutorial on how to make a ruffle headband! 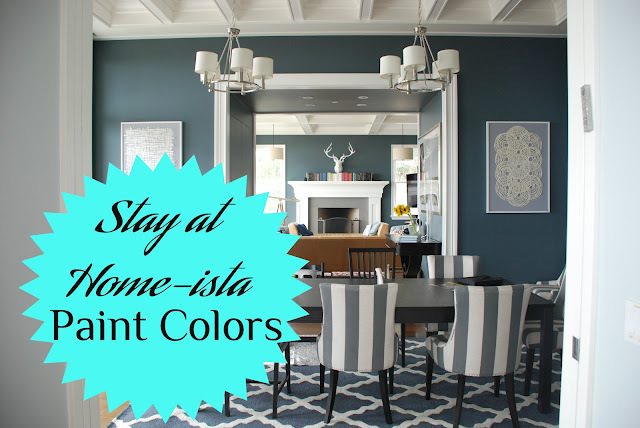 I made one of these for my daughter, Kate, and it was super easy...hope you love it! First, you need to gather a few supplies. 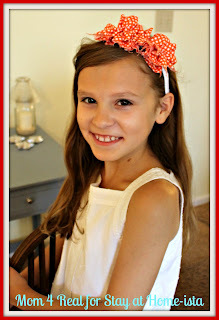 You will need a plastic headband, some white ribbon, a small piece of fabric, a glue gun and a sewing machine. Start by setting the spacing on your sewing machine to 5.0. This will allow you to sew your fabric loosely enough to pull the ruffle. Sew straight down the middle of your fabric. Pull the front thread with one hand, and inch your fabric down with your other hand. Then, tie your front and back threads together on each end. Now, you will need to wrap your headband. 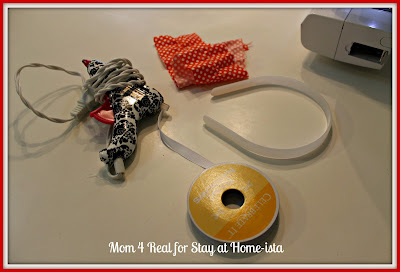 Take the end of your ribbon and hot glue it to the inside of one end of your headband. Start wrapping the ribbon around the headband at a diagonal going upward. Keep wrapping until you reach the other end of the headband and secure to the inside of that end with a dab of hot glue. Finish the edge by wrapping a small piece of ribbon around the bottom edge and secure with hot glue. 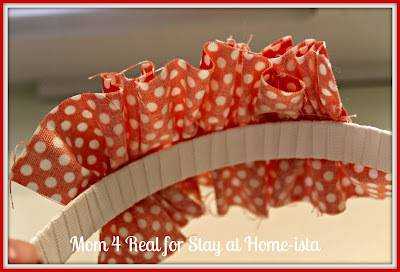 Hot glue your ruffle onto the wrapped headband! That's it! Your headband is ready to wear! Adorable right? You can use just about any fabric to make this headband. I used a scrap piece that I had leftover from another project. I am making another one using a piece of fabric from a leftover shirt next! Thank you so much for having me here today! 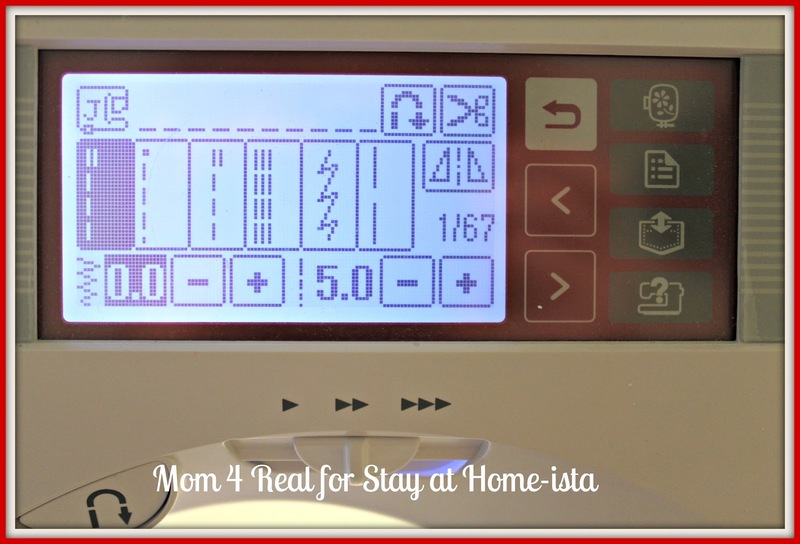 I would love for your to come visit me at Mom 4 Real! so easy! I might even be able to do this! Great tutorial, Jess! Beyond Adorable! And this is why I wish I had at least 1 Girl!?!? lol Great tutorial, you make it look so easy! Cutest Headband Ever!! This is so cute! Gotta do this for my daughter!